Mountain Resort Properties is located in the Sunriver Village Area. Our address is 57084 Grizzly Ln. Take the 3rd Right off of Beaver Dr.
From Hwy. 97, travel approximately two miles to Sunriver's main entrance (Abbot DR). 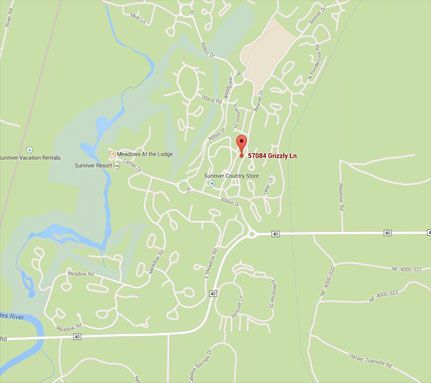 Follow Abbot Dr. for about 1/10 mile, then turn right onto Beaver Dr. We are the third driveway on the right off Beaver Dr. For a Sunriver Map - Click Here! Mountain Resort Properties is open from 8:00am to 5:00pm Monday thru Friday, and 8:30am to 5:00pm Saturday and Sunday. The only day we are closed is Christmas Day. In case of an after hours emergency, please contact us at 541-593-8685. Listen to the voice message in order to obtain the telephone number of the after hours person on call. Emergencies only please. Office hours may vary based on season and/or holidays. Check in is at 4:30 pm. Check out is at 11:00 am. Check in time may be delayed during peak season dates. Early check in may be available during non-peak season dates depending on scheduling, housekeeping, etc. What if we arrive after closing? We do have after hours check in. If you are not here by closing, refer to the confirmation email sent from Mountain Resort Properties. Be sure to bring your paperwork because it contains all the information you need to access your Bend/Sunriver vacation rental. If you do have an after hours emergency, please call (541) 593-8685. Listen to the voice message for the contact number of the person on call. How old do I have to be to rent your homes/condos? The registered guest must be 21 years of age or older. The registered guest must provide a valid I.D. at the time of check in. Subletting of vacation rental(s) is prohibited. Mountain Resort Properties cleans prior to your arrival, and again after you leave. Guests are provided with a bundle of starter supplies. Starter supplies include a roll of paper towels, toilet paper, trash bags, dishwasher pods, liquid dish soap, and laundry soap. Sunriver has two grocery stores: one is located in the Village Mall, and the second is located off of Cottonwood Road. Starter supplies are subject to change w/out notice. What is expected of the renter upon departure? General pickup is required of the renter. However, if the renter strips beds and/or starts the dishwasher, it is greatly appreciated. Secure the property by making sure all doors & windows are closed and locked, turning off all lights, and returning the heat to 55°, and auto. Make sure all small appliances (including oven, stove, barbecue, etc.) are turned OFF. SHARC Passes (if applicable): Please leave SHARC passes in the house/condo, and return them to the hook where you originally found them. Please note that there is a $75 fee for each pass not returned at or before check out. Bring all keys signed out at check in back to the rental office (57084 Grizzly Ln.). Please leave the hot tub/pool keys on the kitchen counter in your unit. For your convenience, Mountain Resort Properties has an after hours drop box located at the front of our office. Kitchen cooking utensils, dishes and silverware, coffee maker, linens, and towels are provided. Mountain Resort also provides a starter supply of hand and dishwasher soap, laundry detergent, toilet paper, paper towels, and garbage bags. Additional items may be purchased as needed by guests at either one of our Sunriver stores. The renter provides all personal items, edibles (this includes condiments & spices), and foil or saran wrap. Cancellation 60 days, or less, prior to your arrival will result in the loss of the total deposit unless we can rebook the home/condo for the same dates. In addition, there will be a $50.00 cancellation/handling fee. Cancellation 61 days, or more, prior to your arrival will result in a $50.00 cancellation/handling fee. Since the weather is beyond our control, we cannot give refunds due to the weather. Can we have an extra person (or child) sleep on the floor/sofa in sleeping bags? Unfortunately, NO (unless they're three years of age or younger). Sunriver and Deschutes County (5.12.020) have occupancy ordinances designed to keep Sunriver the place you'd like to come back to. It is designed not to overtax the water, sewage, road, and other systems required in maintaining a smooth flowing environment. Only the number of people stated in the description of the property, and on the postings in the home, are permitted to sleep in the home. Violation of the maximum overnight occupancy is a class B infraction, and subjects each occupant to a maximum of a $100.00 fine. Per owner contracts, maximum occupancy may be less than allowed by Deschutes County occupancy ordinance. Where do I park my RV/Boat/Trailer? We do have short-term storage available for two weeks or less in our RV Storage Yard. We have North and South yards available. Rental fees are $8 per night (subject to change). To obtain a space, contact the Sunriver Owners Association (SROA) office at 541-593-2411. Arrangements can also be made by email, or over the phone with either a Visa or MasterCard prior to your arrival. You will have access to the storage yard 24 hours a day. Please have the length of what you will be storing available when you call, as we have different size spaces available. The easiest process for reservations is to access their short term reservation system on their website at www.sunriverowners.org. Mountain Resort Properties is not responsible for lost or stolen items. However, we do keep any items we find in our homes for 30 days to be claimed. All lost items can be returned to their owner. To return an item, it is the postage cost + $10.00. This will be billed to the credit card on file. Simply call the front desk and let us know. While we can't guarantee equipment function 100% (i.e. hot tub, bikes, microwave, etc. ), repairs to malfunctioning equipment will be done as soon as possible. We will attempt to fix any problems in a timely manner, and within our means. What if we lose a key and/or SHARC pass? There is a $20.00 lost key charge for each house key not returned to to the management office upon check out. Please leave the hot tub key in the house or condo near the telephone, or on the kitchen counter. There is a $75.00 lost SHARC pass charge for each SHARC pass not returned to the vacation rental upon check out. Yes! We have several homes that allow pets. There is a one time nonrefundable pet fee of $50.00 per pet. We allow a maximum of two pets (price subject to change). Pets are allowed only in designated pet-approved homes and condos. Do the homes/condos have cable? Yes! 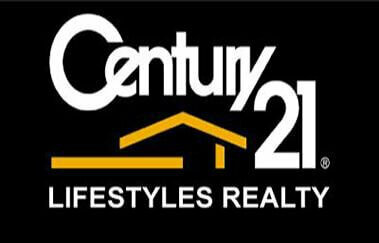 We provide each of our homes and condos with cable. Are there phones in the homes/condos? Phones are available in many of our homes. For your convenience, we offer free local calling in all rentals with provided telephones. 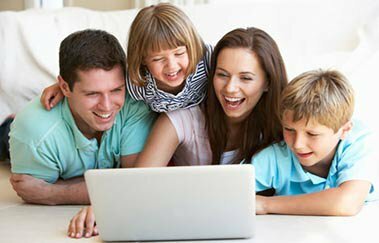 We do have high speed Internet (WiFi) in most of our vacation rental homes and condos. Look at the property description under "Amenities" for details. Homes and condos providing Internet can also be found by selecting "Wi-Fi" under the "Must Haves" tab while searching for available properties. Yes! Gas BBQ's, along with propane, are provided unless otherwise noted in the unit description. We are available to refill your empty propane tank between the hours of 9:00am and 3:30pm 7 days a week (excluding Christmas day). If your tank is empty and you plan to BBQ, please contact our front desk at 541-593-8685. Charcoal BBQ's are not permitted in Sunriver due to the threat of fire. BBQ use is not available during the winter months, as they are put away and stored safely from winter weather (i.e. snow, ice, etc.). Are there bikes included with the rental? Many of our homes/condos include bikes. However, we do recommend bringing your own bikes whenever possible, as bikes are not guaranteed, and are subject to change and downtime w/out notice. Should you arrive and a bike is in need of repair, please notify our office and we will make every attempt to have it repaired. There are also bike rental shops located in and around Sunriver. 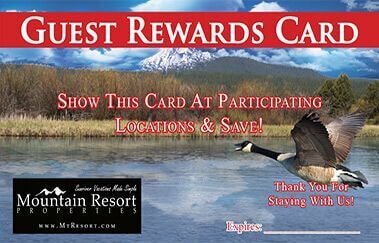 We can provide you with discounts (Guest Rewards) on bike rentals with select Sunriver shops. Sunriver is a resort community approximately 3300+ acres. Sunriver has two 18-hole championship golf courses, 29 outdoor tennis court, SHARC Pool/Tubing Hill, Marina/canoeing, riding stables, 35+ miles of paved bike paths, nature center, observatory, bird watching, white water rafting, restaurants, shopping and so much more! The Deschutes River boarders the West side of Sunriver for 5+ miles. Sunriver is surrounded by the Deschutes National Forest, and is only only 18 miles from Mt. Bachelor. 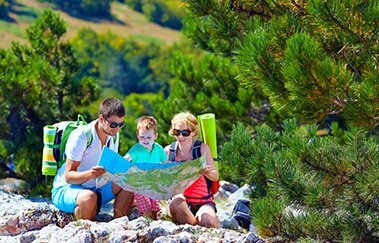 Other activities within an hour or two (most less) of Sunriver include the High Desert Museum, Lava River Caves, Lava Butte, Lava Cast Forest, Crater Lake, Smith Rock, and More!